More and more evidence is supporting the concept that less sleep promotes weight gain and obesity, but several questions remain as to what drive this reaction. The rise in obesity in the U.S. — 36 percent of adults and 18 percent of kids — has been paralleled by a continued decline in sleep duration. This pattern is starting to crop up in other developing nations as they become industrialized. A new investigation takes a look at brain activity in the mental regions responsible for controlling appetite and uncovers interesting patterns in people who are sleep-deprived. Twenty-three adults were recruited to participate in sleep at the University of California, Berkeley. First, each subject had a night of normal sleep — about eight hours — at the research facility. In the morning, their brains were scanned by functional MRI (fMRI) while they looked through a picture book of 80 food items. The foods ranged from low-calorie to high-calories options, and the subjects ranked, on a scale of one to four, how much they wanted each item at that moment. Rather than examining the entire brain, the scientists looked at a few specific regions of interest that have been tied to appetite, motivation to eat, and food salience (whether or not a food item stands out). Seven days later, volunteers returned to the facility and repeated the sleepover, except this time they were not allowed to fall asleep. 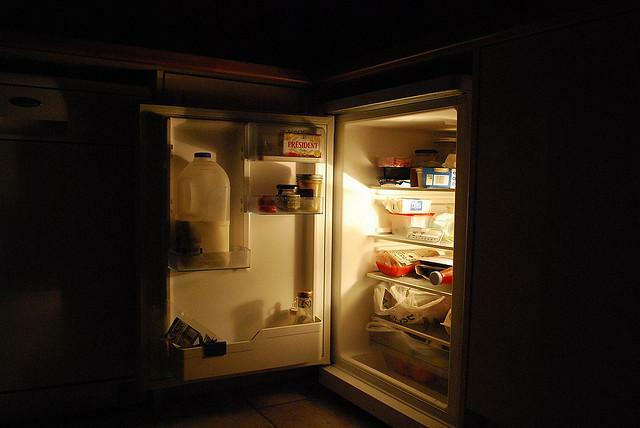 The researchers found that sleep deprivation disrupts food choices in two ways. First, it dampened activity in brain areas — orbital frontal cortex, anterior cingulate, anterior insula — responsible for appetitive evaluation, which factors into people's ability to rank different foods in the mind according to what they might want. At the same time, increased activity was observed in one of the regions that controls the salience of food: the brain's amgydala. In other words, certain foods began to stand out, and when the authors looked at the subjects' chosen preferences, the salient foods had a significantly higher calorie count after sleep deprivation. These findings suggest that sleep deprivation impairs decision-making abilities, while promoting a person's desires for unhealthy foods. Although this is only one small study and the examined brain regions have other functions, the study provides further support to the growing idea that sleep loss is linked to weight gain. "These findings provide a novel brain mechanism by which sleep loss may lead to the development and/or maintenance of obesity through the selection of foods carrying obesogenic (weight-gain) potential, helping to explain the significant association between reduced sleep time and obesity reported in population-level studies1," wrote the authors. "They further emphasize the role of sufficient sleep as a mechanistic factor promoting weight control, one pathway of which appears to be the regulation of central brain mechanisms governing appropriate food choices." Source: Greer SM, Goldstein AN, Walker MP. The impact of sleep deprivation on food desire in the human brain. Nature Communications. 2013.